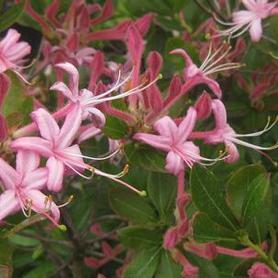 'Blaauw's Pink' Azalea becomes covered with large salmon-pink hose-in-hose flowers in late spring. A very hardy standby for Northern gardens. A Gable Hybrid and evergreen. 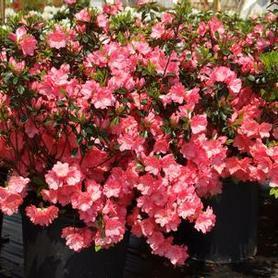 'Conversation Piece' Azalea produces very large pink flowers with splotches of red and white coloring over compact evergreen foliage in mid to late May. 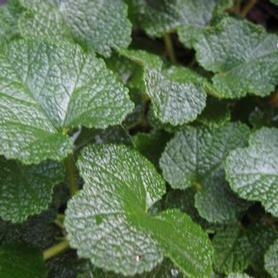 Its dwarf habit is combined with excellent cold hardiness. Bred by Robert Gartrell at his New Jersey home named 'Robin Hill', from whence come many fine compact Azaleas. 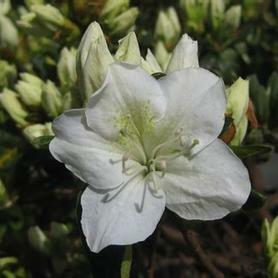 'Delaware Valley White' Azalea has white flowers in May, over light green fuzzy leaves. A Glenn Dale hybrid from Maryland, evergreen. 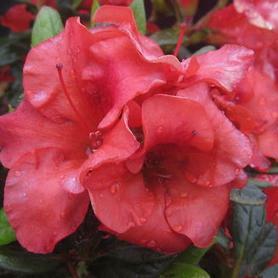 Autumn Embers™ Hybrid Azalea ('Conleb') is one of the hardiest of this exciting group of fall blooming evergreen Azaleas. The flowers start in July and continue through the fall. The large blooms are a deep orange-red in both single and semi-double forms. The habit is low growing and tight, with dark green disease-resistant leaves. From the breeding work of Robert Lee and introduced by Flowerwood Nursery of Mobile, Alabama. Autumn Royalty™ Hybrid Azalea ('Conlec') produces enormous magenta-purple booms from July through fall. The habit is tight but upright, with dark green evergreen foliage. 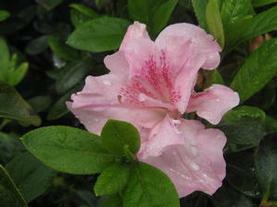 Rhododendron Encore® Autumn Royalty™ was voted “Azalea of the Year” by the American Rhododendron Society. 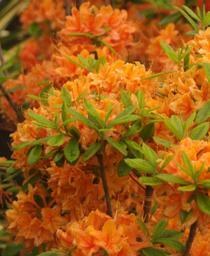 Rhododendron 'Gibraltar' produces large trusses of brilliant orange flowers in May. The large ruffled flowers have a faint fragrance, and are breathtakingly vivid. A deciduous Knap Hill Azalea hybrid. ‘Renee Michelle’ Azalea comes from the prolific hybridizing work of Girard Nurseries in Ohio, and is a beautiful compact evergreen Azalea. 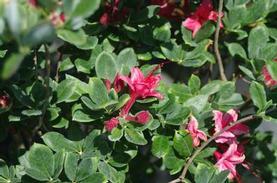 The flowers are large and a good clean pink in late spring, over glossy dark green foliage. An added beauty is the fall and winter color, when leaves take on shades of reddish-purple. The winter hardiness is excellent, as Dr. Michael Dirr found in his Illinois winter garden. 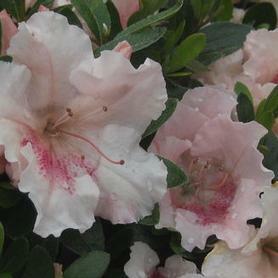 'Gumpo Pink' Azalea has large soft salmon pink flowers in June over tiny green foliage. The flowers look much bigger than you would expect for the leaf size. A Satsuki hybrid from Japan. Evergreen. 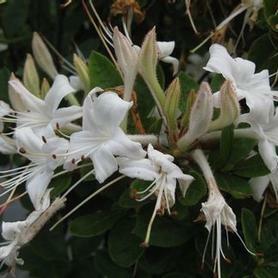 'Gumpo White' Azalea has large white flowers in June over tiny green foliage. When in bloom, the foliage is obscured by the white blooms. A Satsuki hybrid from Japan. Evergreen. Single crimson-red flowers in May over compact, shiny green foliage which turns an attractive bronze in winter. 'Hino-Crimson' Azalea is a Kurume hybrid. Evergreen. 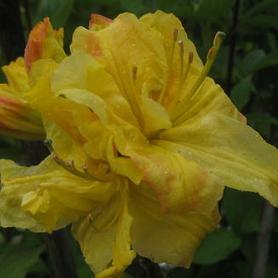 ‘Klondyke’ Azalea produces large deep yellow flower trusses in May on the ends of the upright branches. The new foliage starts in shades of bronze, turning rapidly to a medium green. 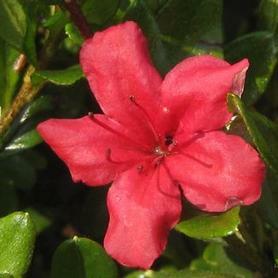 The habit of ‘Klondyke’ Azalea is upright and compact. It originated as one of the Knap Hill hybrids. 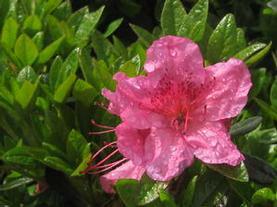 Hose-in-hose soft pink blooms appear on 'Nancy of Robin Hill' Azalea in mid-May. Foliage is evergreen and dense. 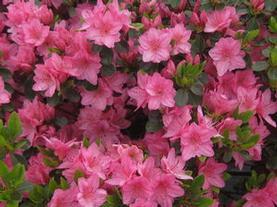 This Azalea stays in bloom for an extended period. Hybridized by Robert Gartrell of New Jersey. 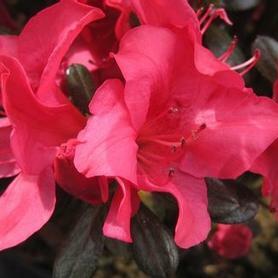 'Tradition' Azalea has a clear medium semi-double pink flowers in May over dark green shiny evergreen foliage. A Kurume hybrid. 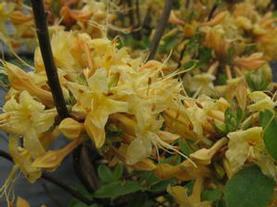 'My Mary' deciduous Azalea blooms in May, producing clusters of fragrant deep yellow blooms. The habit is loosely upright, and 'My Mary' lights up woodland settings when in bloom. This is a complex hybrid, combining excellent qualities from all three parents (austrinum, atlanticum and periclymenoides). Produced by the late George plantsman George Beasley who named it for his wife. 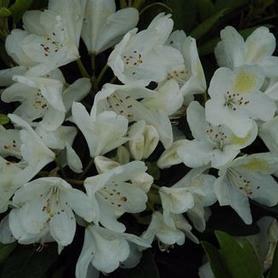 The white flower trusses of Rhododendron catawbiense 'Chionoides' have yellow centers, and are held above the green-leafed compact plant in May. A tidy, handsome shrub year-round, with attractive, neat evergreen foliage. Lavender-pink flowers on a disease-resistant, heat and cold tolerant plant. Rhododendron catawbiense 'Roseum Elegans' is a tough, reliable broadleaf evergreen, blooming in May and June dependably, year after year. My favorite nickname I've heard for it is 'Rosie O'Mulligan Roadie'. Rhododendron kaempferi 'Johanna' Azalea has large red flowers, and is one of the best red Azaleas available. Leaves are semi-evergreen. Winter color is a bronzy purple. PRN Preferred: The winter foliage color is just as showy as the spring blooms. 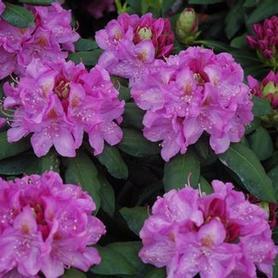 'Roseum Bluestem' Rosebay Rhododendron blooms in late May and early June, producing pinkish lavender trusses over large narrow evergreen foliage. 'Roseum Bluestem' gets its name from the reddish stems, and is a selection by Rarefind Nursery of Jackson, NJ. Like other selections of Rhododendron maximum 'Roseum', Rhododendron 'Mr Blue Stem' flowers for a long time, in between R. catawbiense and R. maximum bloom time. 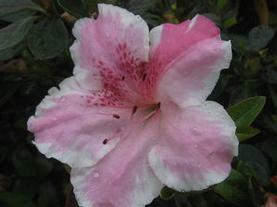 Pinxterbloom Azalea blooms April to early May and flower color ranges from white to pink. It is mildly fragrant, and tolerates dry sites and acidic soils. Deciduous. 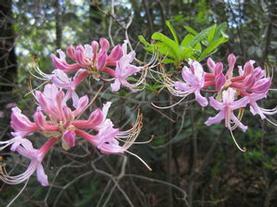 Swamp Azalea has white flowers in May and June with a clove-like fragrance. It is wet site tolerant. 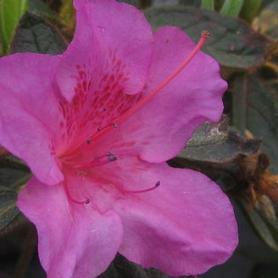 'Betty Cummins' Swamp Azalea was found along a New Jersey road by Dave Lewis, who named it after the great Rhododendron breeder Betty Cummins. The fragrant bright pink flowers appear in June and July over dark green deciduous foliage. Pollinators and hummingbirds are drawn to them. Rhododendron viscosum 'Betty Cummins' is an easy to grow native, since it copes with a variety of acid soil condition, from average drainage to swampy sites. 'Millennium' Swamp Azalea comes from years of breeding work with deciduous native Azaleas at Weston Nurseries in Massachusetts. Rhododendron viscosum 'Millennium' produces small fragrant blooms in late May and June, starting with velvety red buds that open to dark pink flower clumps. The bloom period is a month or more, especially when the spent flowers are deadheaded. The foliage is green with a glaucous silver underside. 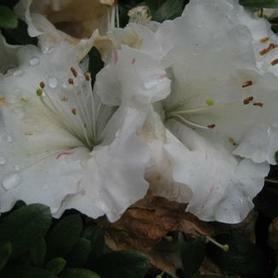 Rhododendron 'Millennium' is happiest in moist, acidic soils in both sun and partial shade. 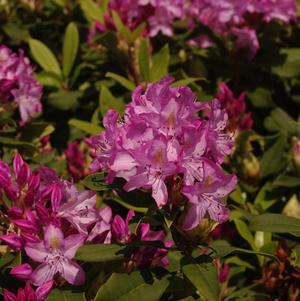 Pennsylvania Rhododendron is a late blooming deciduous Azalea resulting from a controlled cross made by Weston Nurseries between R. periclymenoides and tow other named cultivars. The flowers appear in June and July in shades of deep pink with orange yellow throats. Our friend Larry Kuser of Fernbrook Nursery recommends it for its great fragrance and its neat compact habit. The fall color is shades of copper red. 'Weston's Lemon Drop' is a lovely hybrid deciduous Azalea from Weston Nurseries' extensive breeding work. The buds are peach colored, and open to a soft yellow in May and June. 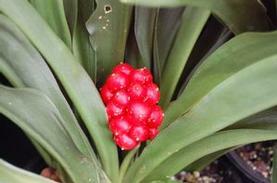 The flowers of this interspecific hybrid are fragrant, and the bluish green foliage turns reddish maroon in fall. The Mezzit family of Hopkinton, MA has contributed a huge number of excellent Rhododendrons to the gardening world, and this one is one of the best ones. 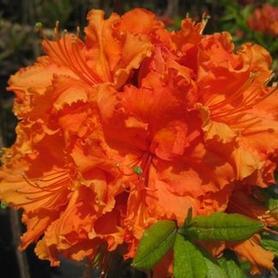 'Tangerine Delight' Hybrid Flame Azalea is a result of a beautiful cross between R. calendulaceum and a Knaphill Azalea. The habit is mounded with deciduous foliage, topped by large showy clusters of fragrant orange and peach colored flowers in May and June. Although eventually large, Rhododendron 'Tangerine Delight' has dense branching, and would make an excellent hedge as well as a large specimen. The Native Azaleas which flourish on the East Coast are wonderfully varied, growing in different habitats from warm coastal wetlands to rocky cold mountaintops, and everywhere in between. They are all deciduous, and an important nectar source for insects and butterflies. We have several decidous varieties, of different flower colors and bloom times. Please review our current availability for a complete list of varieties. The Evergreen Azaleas which light up our landscapes in the spring come in a huge range of colors, sizes, bloom times and foliage shapes. We offer ones that we know are proven to do well in our geographical area, including a number that are our own personal favorites. Some of them even offer showy winter foliage in additional to their spring flower display. We have selected a few cultivars of Rhododendrons that we have found to be practically indispensable to the Northeast landscapes. Our focus has been on disease resistance and site flexibility, as well as flower beauty. 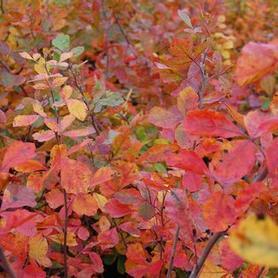 'Gro-Low' Fragrant Sumac has brilliant red fall foliage. 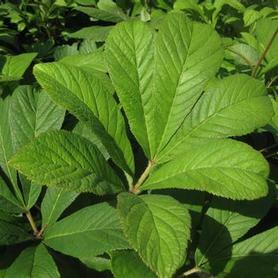 An introduction from Synnestvedt Nursery, its summer foliage is green and somewhat lustrous. Great for dry locations and banks, especially in deer infested areas. Our Production Manager, Daryl Kobesky says Rhus aromatica 'Gro-Low' is great for parking lot islands because it is so tough and salt tolerant. PRN Preferred: This is an indistructable multi season groundcover. 'Creel's Quintet' Shining Sumac is a compact, landscape-worthy variety of this tough native plant. It has the beautiful burgundy-red coloration of the species, but it reaches a maximum height of only 8 to 10'. Its habit is suckering, so the clump will get wide eventually. Since it is a female form, the fruit it produces is an important food source in the winter for both birds and mammals. 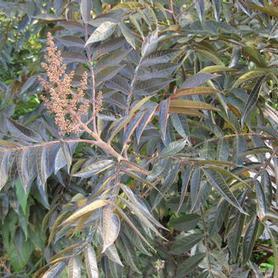 Mike Creel of Lexington, SC introduced it, and the "Quintet" refers to its set of 5 glossy leaflets per leaf, as opposed to the 9 or more produced on the species Rhus copallina. In the summer, the creamy yellow flower spikes add to the beauty of this dry site tolerant plant. 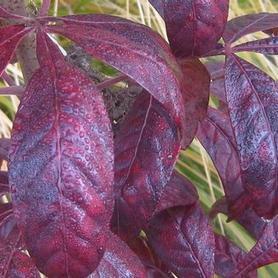 'Lanham's Purple' Shining Sumac is a mid sized selection with lustrous purple new growth in spring and early summer. By mid summer the color has matured to burgundy-green, and the fall color is a striking combination of purple, red, orange and yellow. It is very tolerant of poor dry sites, and colonizes banks, hillsides and rocky areas well with its suckering habit. It was found by the late Gary Lanham of Kentucky. 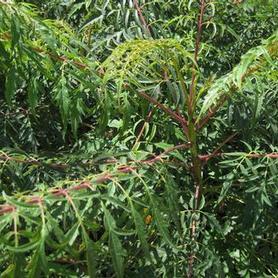 Smooth Sumac has shiny young stems supporting the long green pinnate leaves which have glaucous undersides. The fall color is spectacular yellow-orange-red, and the leaf petioles are often a showy red as well. 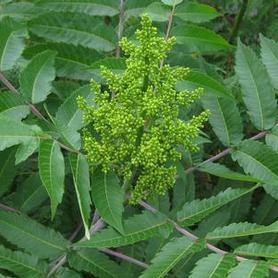 Rhus glabra is extremely tough, prospering in dry, infertile sites as well as good sites. Excellent for mass planting and hillsides because of its suckering habit. Cutleaf Smooth Sumac has delicately dissected dark green leaves which turn orange-red in fall. The petioles are an attractive red in summer as well. It has a suckering habit and great tolerance for dry, poor soil sites. 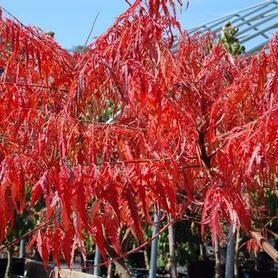 Cutleaf Staghorn Sumac has brilliant orange-red fall foliage with striking lacy leaves on fuzzy stems. Upright red fall seed clumps provide important food for many birds in winter. Rhus typhina 'Laciniata' ('Dissecta') is very tolerant of dry poor soils. First Editions® Tiger Eyes® ('Bailtiger') Staghorn Sumac has chartreuse and brilliant yellow finely dissected leaves with red stems. Rhus typhina Tiger Eyes® has striking orange and red fall foliage, and is an exciting new native for tough sites, from Bailey Nurseries in Minnesota. Prefers a dry site. PRN Preferred: Amazing foliage color both summer and fall, especially good in dry sites. 'Fireworks' Featherleaf Rodgersia has tall rose-red flowers in June and July, held above red-margined large coarse leaves. Prefers moist sites. 'Hercules' Featherleaf Rodgersia has tall flowers in June and July that are rose, aging to pink over dramatic bronzy foliage which ages to shiny green. Wet site tolerant. Rohdea japonica or Sacred Lily has broad strap-like evergreen leaves which look exotic, especially when topped by red winter berries in clumps. The fruit lasts for up to 5 months. A hard-to-find, long-lived and tough perennial. 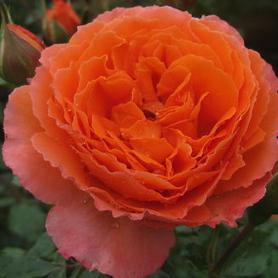 Adobe Sunrise™ ('Meipluvia') Rose has lots of double salmon-orange flowers on a compact disease resistant plant. 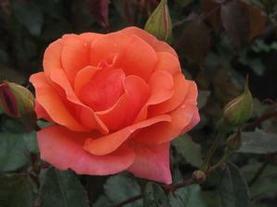 It is a floribunda, and blooms almost all summer and into the fall. A Meidiland® Rose introduction. The pink single flowers of Carefree Delight® ('Meipotal') Rose have white centers and it blooms all summer. A great rose for mass plantings. Carefree Wonder™ ('Meipitac') Rose has pink double flowers which are two-toned because the outsides of the petals are white. It blooms all summer. One of the newer exciting children of the Knock Out® program, Coral Knock Out® (formerly Carefree Celebration™), has double coral orange flowers all summer until frost. It has the same wonderful disease resistance that its other siblings have. From William Radler. PRN Preferred: Blooms all summer whth beautifully clean foliage. Double Knock Out® ('Radtko') Rose is another amazing Rose from the Knock Out® series, with double cherry-red flowers all summer into fall, as well as the beautiful foliage of its parent, Knock Out®. 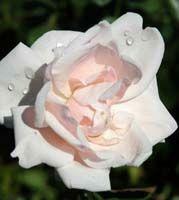 Icecap™ ('Meiradena') is a compact repeat blooming Rose that produces a great quantity of white semi-double flowers. The foliage is clean and disease resistant. Rosa Icecap™ is a result of a partnership between Will Radler (the father of the Knock Out® Rose) and the french hybridizers, Meilland. An excellent choice for mass plantings. Knock Out® ('Radrazz') Rose has cherry-red semi-double flowers on beautiful bronzy new growth and disease-free dark green foliage. A tremendous plant introduced by William Radler. It will never stop blooming for you throughout the summer and fall. 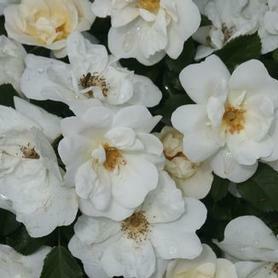 Knock Out® White Out™ ('Radwhite') Rose is another winner from William Radler. The glistening single white flowers cover the dark green disease-resistant foliage. Michael Bowell of 'Create a Scene' in Pennsylvania accurately likens the flower form to American Dogwood flowers. Limoncello™ ('MEljecycka') Shrub Rose produces clear yellow flowers prolifically all summer, over dark green disease resistant foliage. The 3" blooms are single and very fragrant. This is the first strong yellow bloomer from the Meidiland® breeding program in France, introduced into the US by Star Roses. Because of its summer-long flowering performance and its excellent disease resistance, Limoncello™ is an excellent choice for large landscape plantings. 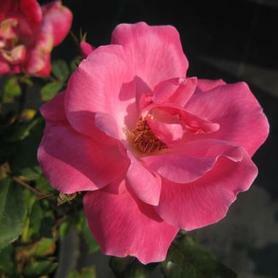 'New Dawn' Rose has small pink fragrant double flowers, great hardiness and is a good rebloomer. Per Stephen Scaniello, who knows all things rose-related, this was the first plant ever patented in the USA. It also showed good salt tolerance through the recent hurricanes on the Jersey shore. One of the newest releases from William Radler. Pink Double Knock Out® ('Radtkopink') Rose is a bubblegum-pink Rose that has all the foliage attributes of its Knock Out® siblings and it's a double. Blooms all summer into the fall. 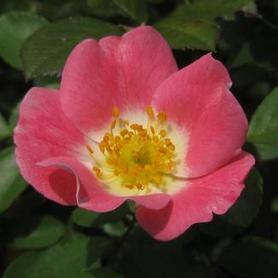 Pink Drift® ('Meijocos') Rose starts blooming in late spring and continues producing flowers all summer into fall. This neat, compact groundcover is covered with single pink blooms which are rendered more interesting by the white centers and yellow stamens. 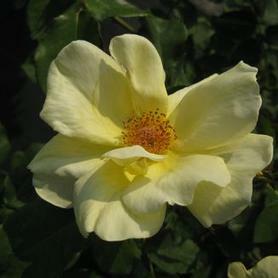 The foliage, like the other Drift® Series Roses we carry, is clean, green and disease resistant. Another introduction from Meilland Roses of France. Fluorescent pink single to semi-double flowers on disease-free foliage, Pink Knock Out® ('Radcon') Rose has bronze new growth. Found by Conard-Pyle Nurseries, it blooms without stopping all summer. Red Drift® ('Meijocos') is a double scarlet red. 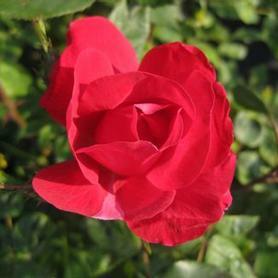 Ruby Meidiland® ('Meipreston') Rose is covered with ruby-red double flowers. It blooms all summer, and has very clean foliage. One of our favorite small shrub Roses. PRN Preferred: We love the compact size, disease resistance and summer long flowering. We also get great feedback from our customers on this variety. 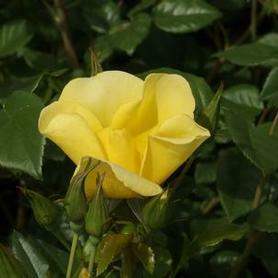 Sunny Knock Out® ('Radsunny') Rose is another long-awaited winner from William Radler's Knock Out® program, with single bright yellow flowers and the disease resistant foliage of its siblings. It blooms all summer, and the color is deeper in cooler weather. 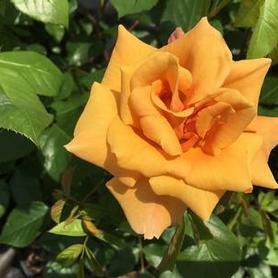 Tequila™ ('Meipomolo') Shrub Rose produces semi-double apricot blooms for an extended period in summer. 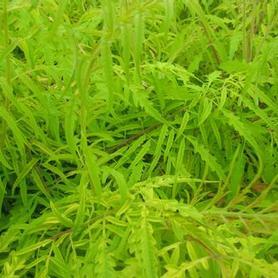 The foliage is a clean lustrous green, and tolerant of hot dry conditions. The growth habit of Tequila™ makes it a good candidate for compact hedges, as well as a lovely addition to the landscape for cut flowers. Introduced by Meilland International. 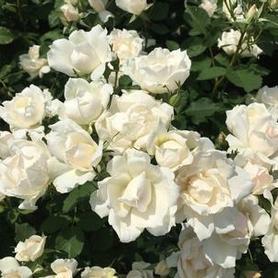 White Drift® ('Meizorland') Rose is a new ever blooming groundcover introduction with loads of diminutive white double flowers from early summer into fall. 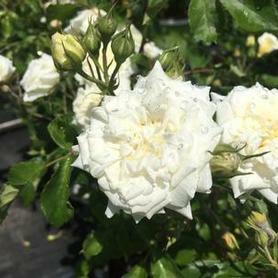 Like the other Drift® series of compact roses, White Drift® has excellent disease resistance. Excellent for rock gardens, flower bed borders and containers. 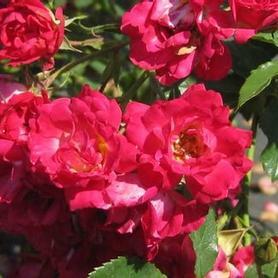 'Zephirine Drouhin' Rose has cerise pink semi-double flowers which are very fragrant. The stems are virtually thornless. It reblooms in the fall. PRN Preferred: A long lasting climber with virtually no thorns! 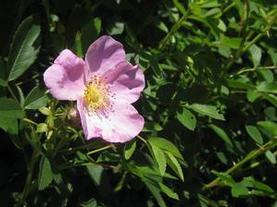 Carolina Rose is a tough native Rose, blooming in May with bright pink fragrant single flowers. Found in glades, swamps and pastures, Rosa carolina spreads by suckers to form a large patch eventually. The vivid pink blossoms are followed by red hips in the fall which are a good source of food and vitamin C for birds. Like most native Roses, Carolina or Pasture Rose is more disease resistant than most commercial Roses, including Rose Rosette disease. Rugosa Rose has single magenta-pink highly fragrant flowers June through August, followed by large, bright orange rose hips in fall. Excellent colonizer of salty, sandy locations. 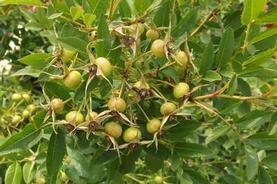 The fruit is highly attractive to wildlife, but deer tend to leave the plants alone (too spiny). 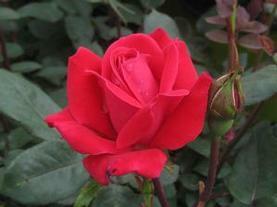 PRN Preferred: A Rose that is both deer resistant and extremely fragrant. 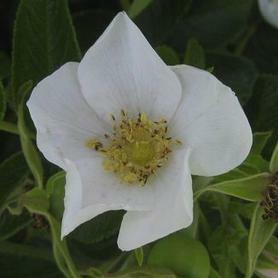 Rosa rugosa 'Alba' flowers from June through August, with single white very fragrant flowers. The blooms are followed by attractive orange hips and good foliage fall color. Very salt tolerant. 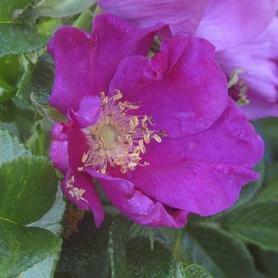 Rosa virginiana has fragrant single pink blooms in June on long prickly branches with glossy green leaves. Fall color is an attractive orange, red and yellow, accented by shiny red rose hips remaining into winter. Salt and seashore loving. 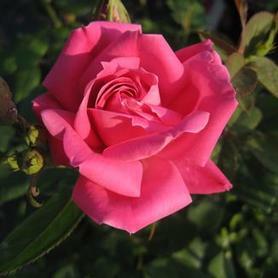 Rose Rosette resistant per Bill Barnes. 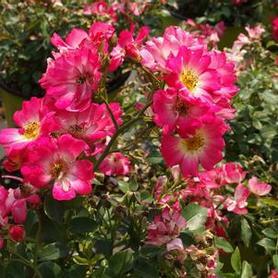 Oso Easy Pleasy™ Rose ('Phyllis Sherman') is a reblooming Shrub Rose, producing clusters of small deep pink semi double flowers from early summer through early fall. The bright green foliage is disease resistant, and Rosa x Oso Easy Pleasy™ is low maintenance because the blooms are self-cleaning. Butterflies and other pollinators are drawn to the flower display. 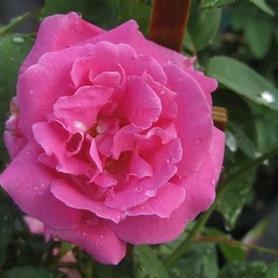 Because of its tight compact habit, Oso Easy Pleasy™ Rose performs well in perennial beds and makes a good small hedge. 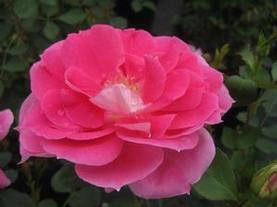 Ringo™ Shrub Rose ('ChewBullseye') comes from the breeding work of Chris Warner of England. The single flowers are very unusual in that they open bright yellow with red centers, and as they age they change to soft yellow and then white with pink centers. Since Rosa x Ringo™ blooms all summer, there is a constant display of all the color forms, Ringo™ has clean disease resistant foliage and has won awards in a number of international Rose trials. Our Climbing Roses are all trellised and available in 3 gallon containers. They cover a broad range of sizes and colors, and we have selected varieties that have good foliage disease resistance. Our Groundcover Roses are all under 3' in mature heights and are available in 3 gallon containers. We have selected the cultivars we grow for long bloom period and disease resistance. Many of them have proven themselves for years in our display beds, blooming throughout the summer and into the fall. These Roses are an exciting new offer from the Meidiland® Rose program, developed specifically to answer the need for very small Roses for groundcovers and containers. The Drift® Series grow to about 18" and bloom without stopping all summer. They have excellent disease resistance. Hot weather doesn't faze them; they just keep performing. We carry Apricot Drift®, Coral Drift®, Red Drift® and Sweet Drift® varieties. 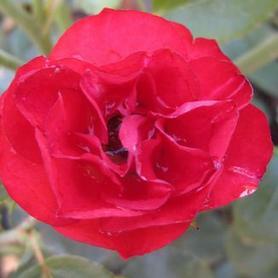 We grow an extensive list of Shrub Roses, with different habits, eventual sizes and flower colors. For cultivars, descriptions and flower pictures, please consult our website’s plant library or contact us. 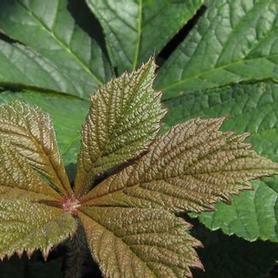 Creeping Raspberry is a fast growing groundcover with leathery green leaves with small white flowers in late spring. They are followed by red fruit in late summer. The evergreen foliage turns reddish-burgundy in the fall and winter. The rapid, dense growth of Rubus calycinoides makes it particularly effective for erosion control or for cascading over walls. The yellow flowers of Black-Eyed Susan are later blooming than R. 'Goldsturm', extending the Black-Eyed Susan period up until frost. More wild and natural looking than the cultivars. Rudbeckia fulgida var. fulgida seeds vigorously, and makes a wonderful filler for natural areas. Birds depend on the seeds for winter food. PRN Preferred: Looks more natural and blooms for a long time. 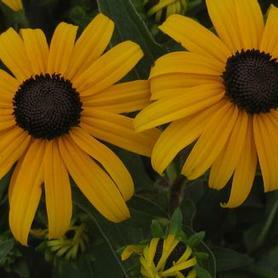 'Goldsturm' Black-Eyed Susan has yellow-gold flowers in June and July, making a wonderful display when planted in groups. It spreads to make a large mass eventually, so it can be used as a tall groundcover. Was found in a Czechoslovakia nursery in 1937. 1999 Perennial Plant of the Year. Seeds are an important winter bird food source. 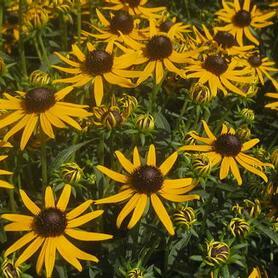 'Little Goldstar' Black-Eyed Susan has a shorter sturdier habit than R. 'Goldsturm', which makes it much more useful for smaller spaces, as well as summer and fall mixed containers. 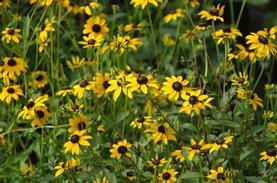 Butterflies love the blooms and afterwards finches love the seed heads. Since it comes from tissue culture, it is very uniform in masses. A Jelitto Seed introduction. 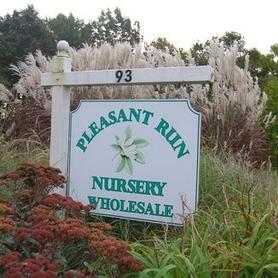 PRN Preferred: We love the compact size and the plentiful flower display. Very cheery. Rudbeckia maxima has huge powder blue leaves (hence the common name 'Dumbo Ears') topped by yellow cone flowers in June and July. The flower stalks rise to over 7' tall. 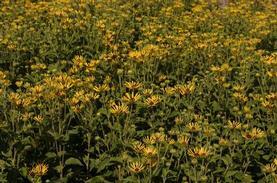 Rudbeckia maxima prefers moist, fertile soils but will thrive in average garden conditions in full sun. It likes wet feet, yet is surprisingly drought tolerant. Foliage is striking and almost tropical looking, like a blue-green Canna. Seeds are an important winter bird food source. 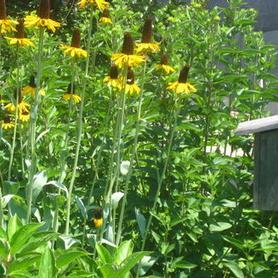 'Henry Eilers' Sweet Coneflower blooms in August and September, with loads of interesting quill-petalled yellow flowers. The small cones have dark brown centers and the contrast is striking. A wonderful addition to tall meadow landscapes. The foliage has a subtle anise fragrance. Introduced by North Creek Nurseries. 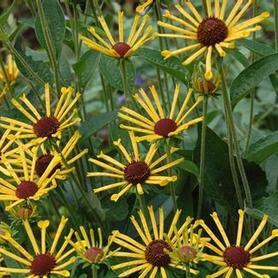 'Little Henry' Sweet Coneflower has the quilled yellow petals surrounding the brown cones of 'Henry Eiler', but the unusual flower display comes with a much shorter stature. The daisy-like flowers are produced in mid summer to early fall, and bright yellow petals are "quilled", or rolled up like tiny tubes. They cover the green anise smelling foliage and are held on strong, non-flopping stems. An introduction from Terra Nova Nurseries.